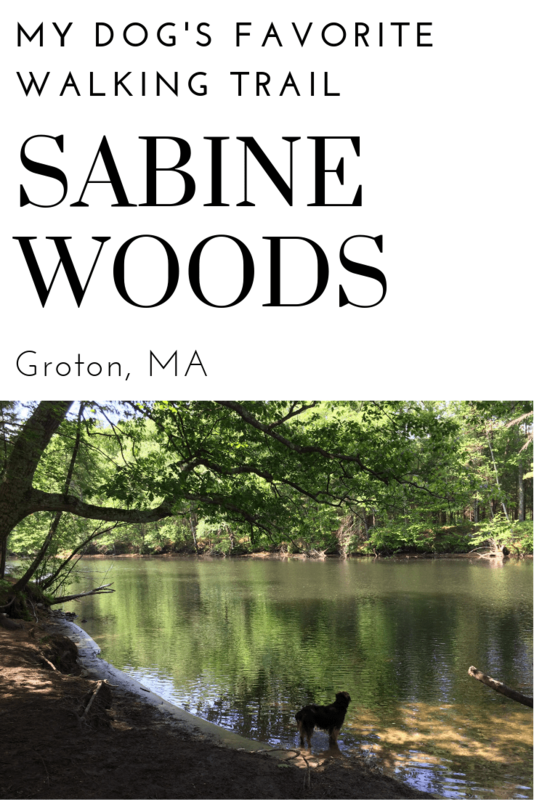 In Groton, MA you can find a beautiful wildlife sanctuary called Sabine Woods. After you cross the bridge, your dog can be off leash. I usually bear to the right, cross the field and walk until I reach the river. There is a trail that runs along the bank of the Nashua River. I love how the trees lean over the water, each leaf straining to get a piece of sunlight. In the spring, tree frogs will serenade you from the vernal pools just within the forest. Throughout the sanctuary, you will find some neat statues and monuments. The park is well maintained like a nature reserve. The public access trail will eventually end at the Groton Boat House where you will have to turn back and retrace your steps. On a hot day, your dog will love running down to the banks of the river to get a drink or cool off. This is a well used trail with many dogs around, so be weary of that if you have a caution dog. On my way out, I love grabbing a salad at the Salt and Light Cafe which is right on Main Street. Their food is delicious! Long Hill Road (Route 225) with parking at New England Forestry Foundation property Groton Place. Trails are open dusk till dawn.